At Réveur we take immense pride in offering the highest level of service to our customers through a wide range of quality tried and tested linen at competitive prices. Our consistent efforts to improve our range have earned us recognition as being a key supplier to the hospitality industry and in particular to, safari lodges and boutique hotels. Our customer base includes re-sellers and all consumers of linen. We use only the best quality linen and inners that we can find to ensure that your linen will last for many years in your establishment. Using the state of the art manufacturing process, the mills produce woven fabrics that are strong and beautifully soft, yet highly durable and easy to care for. 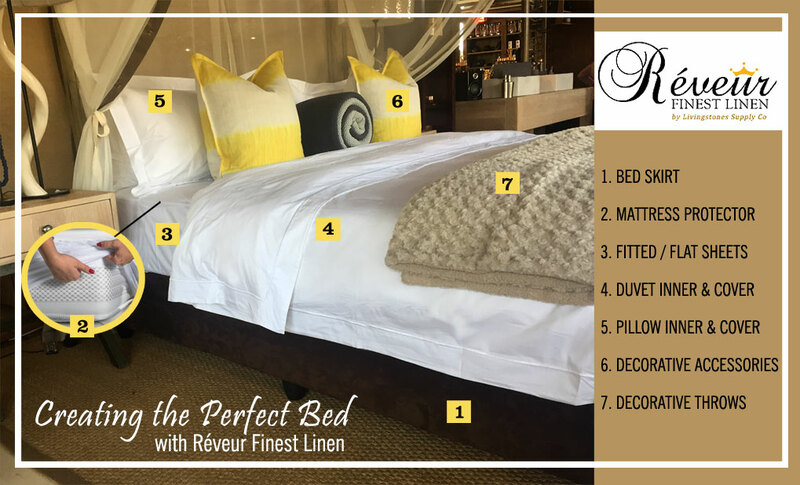 Our Réveur linen is produced using quality imported percale fabrics in authentic 200 thread count up to the ultra luxurious 800 thread count. Depending on the customers own requirements. We also offer embroidering for our customers who require bespoke linen. Within this range all our customers should be able to find a suitable balance between comfort, luxury and value. Choose from our extensive range of quality bed linen, duvet inners, pillows, mattress and pillow protectors (quilted and waterproof), converters, table linen (from serviettes to table cloths) as well as spa products including kimono gowns and eye masks. You will be pleased with our selection, prices and service. Please feel free to browse our online shop or contact our representatives for more information on our manufacturing of Hotel Linens. All linen is made to order, which means we tailor your linen to your exact requirements. Filled with a synthetic hollow fibre. Totally non-allergenic, and fully machine washable. Filled with a synthetic hollow fibre that mimics goose down in feel and comfort. Totally non-allergenic, and fully machine washable. All pillow casings are constructed in 100% cotton percale. All our products are beautifully piped around the edges.